Do you know the speed limits? Below we have compiled a resource of information detailing the current speed limits and also other useful information and guidelines for sensible driving in different conditions. You should always keep your speed below the maximum speed limit for the road you are driving on. Although you are not legally obliged to drive at the maximum speed limit, if it is safe to do, you should try and drive at a speed that at least approaches it for instance in a 40 km/h zone your speed should be between 35 and 40 km/h. Driving too slowly can be as dangerous as driving too fast. The driver who toddles along a 80 km/h road at 40 km/h causes tailbacks and frustration. This can lead to dangerous overtaking manoeuvres and other road safety issues. Speed in itself is not that dangerous, inappropriate speed is. Always take into account the weather and road conditions. Driving at 80 km/h, even though you are legally entitled to do so, when there is ice on the road is dangerous and inappropriate, as is driving at 40 km/h on a dual carriageway when the weather is fine. 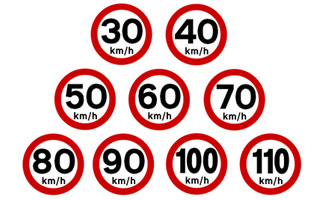 These speed limits apply at all times, whether during the rush hour or the dead of night and are overridden only if a road sign indicates a different speed limit.